Kate Gilmore received a BFA from Bates College and an MFA from the School of Visual Arts in 2002. 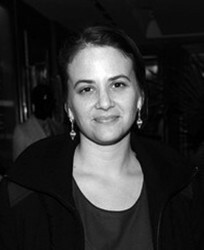 She has had solo exhibitions at venues including Artpace, San Antonio; Maisterravalbuena Galeria, Madrid; White Columns, New York; and Real Art Ways, Hartford. In 2009 her work was on view at Franco Soffiantino Arte Contemporanea, Turin Italy, and last summer Gilmore’s performance art piece Walk the Walk, sponsored by Public Art Fund, was filmed in New York City’s Bryant Park. Selected group exhibitions include Environments and Empires, Rose Art Museum at Brandeis University, Waltham (2008); Reckless Behavior, J. Paul Getty Museum, Los Angeles (2006); Greater New York 2005 and Greater New York: 5 Year Review in 2010, PS1 Contemporary Art Center/MoMA, Long Island City; and 2010 Whitney Biennial, Whitney Museum of American Art, New. Gilmore was recently awarded the Rome Prize, American Academy in Rome, Italy (2007); the Louis Comfort Tiffany Foundation Award, New York (2009), and Lower Manhattan Cultural Council Award for Artistic Excellence, New York (2010).